Do you want to know the weirdest thing about Sheryl Sandberg's book, Lean In, Readers? I relate to it. That is weird. Why would I relate to a book about climbing the corporate ladder? Excuse me, climbing the corporate jungle gym, as Sandberg prefers to describe it. I’ve done everything I could to arrange my life so that I would have blocks of free time in the afternoon. This plan has led me as far away from corporate life as anything could have. I worked in an office right after college, and I discovered that it depressed the hell out of me. After ruining a perfectly swell linen skirt with grass stains on my lunch hour, I had to face it: I am not your corporate type. Whatever that is. On the other hand, why wouldn’t I relate to a book about how a seemingly competent woman struggles with self-doubt and has to double think and analyze every step she makes? If I’d known I could do that on a stupendously large salary, I might have stayed on the professional path. 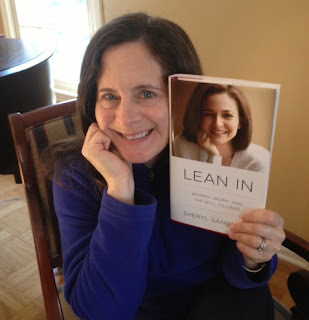 I’ve been kind of appalled by the responses to Lean In. It’s too one-percenty. It’s about “clawing your way to the top.” It doesn’t consider the real problems of most working women, or of most women, or of other particular groups of women. She was “lucky “ to have Important Male Mentors. So what? Does every woman have to speak for every other woman to speak truth? To make a difference? Isn’t Sheryl Sandberg’s experience as valid as mine? Or yours? Or your cleaning lady’s? And frankly, it’s the one percent who can make some immediate policy changes just by being who they are at the top. Is this bad? I have to admit that I was one of the people who read Sandberg’s Barnard commencement address a couple of years ago, and her profile in the New Yorker last year, with skepticism. I wanted to hate her. I wanted to find the flaw. If she’s a great business woman, then she must be a sucky mom, right? Or be divorced. Or hate other women. When I really paid attention to her, however, I had to admire her words and recognize my own thwarted ambition. A lot of people complain that she’s blaming the victim, telling women they have to fix themselves internally before structural change will occur. To them I say, have you actually read the book? She’s talking about the need for internal and external changes. Leaning in means not prematurely cutting yourself off from seeking promotions or taking on extra leadership roles just because you might want flexibility to have a personal life and children. She says it’s better to lean in to your goals and keep going towards them, and work out the details later; don’t cut off possibilities for yourself because you’re afraid you’ll have too much work or responsibility. When women do that – and they definitely do – then they often find themselves in lesser work that’s unfulfilling, and ultimately they may drop out of the workforce. Speaking as one of many women who has lamented her lack of mentors and looked at finding one as the deus ex machina necessary to success, let me say, “Ouch!” However, after rubbing that bruise, let me also say that her words echo the phrase, attributed to Buddha and familiar to habitués of yoga studios and meditation retreats everywhere, “When the student is ready, the teacher will appear.” Honestly, she’s just saying you’ve got to work hard. No one is going to get you there until you’ve proven yourself. 2. She’s honest about her intellect, her luck, and all the help she’s received from men, from women, from bosses, and from assistants. 3. She’s honest about her mistakes, like the time she failed to see the raised hand of one of the few women in the room and called on man after man. At a talk on gender equality. 4. She says she’s a feminist. If you think this is minor, just check with any female under forty and find out if she wants to identify herself as feminist, and then look at the other prominent women in business and notice how they distance themselves from the term, and from the “issues” that are “women’s.” Why do you think we haven’t had that final burst of change that would institute meaningful family leave policies, equal pay, paid sick leave, and flexible scheduling across all industries, businesses, jobs? Because women have had to distance themselves from these issues to get ahead. And once they do, like Melissa Mayer, Chief Yahoo at Yahoo, they pretend being a woman makes no difference in the world. 5. She gives practical advice. She talks about how to negotiate salary. She talks about how to navigate the mentor-mentee relationship. She talks about how to handle negative criticism. In every instance she talks about challenges she overcame. Yes, Sheryl Sandberg is different from most of us. She’s a corporate superstar, very bright, extremely ambitious, and powerful. She’s not a professional automaton, however; she’s a very human professional. By showing her humanness, she’s also in the vanguard of a changing working paradigm. This is what we were aiming for, back in the 1980s. She made it up there and now she wants to encourage more women and men to join her, and to be human about it. Maybe you don’t want to be part of her working world. Maybe your ambitions are totally different from hers. But I honestly believe that it’s people like Sheryl Sandberg who will help shape work life policy in a more equitable, family-friendly direction, and that will in turn make life better for all of us. She’s speaking her truth, and encouraging others to speak theirs. I say, applaud her for bringing the focus back to what a lot of us would like to think is old news: We’d like to think those feminist battles have been won, because they were exhausting. The battles were not won, however, and the movement, until very recently, had been beaten back into the tributaries of academia and radicalism. With Sheryl Sandberg, the women's movement, feminism, whatever you want to call the effort to achieve equality between women and men has moved back into the mainstream. Let’s lean in on that! Thanks for this! I was biased to think she was a 1% elitist, but I agree with everything you've said. Well done. Okay, you have convinced me that I need to read this book. I have definitely resisted leaning in, and have approached career opportunities with more trepidation than enthusiasm, which is a hard habit to break. Interestingly enough, on the mentor front, I'm learning a lot from my younger female colleagues, who seem to possess much more confidence professionally than I rememember feeling at their stage in life. I'm learning from them! Yes, you really should. It's given me all these strange ideas about how I haven't fully used my skills. I think you'd enjoy the book. I'd be interested to hear if interpret it the way I did.